Video game developer Blizzard is ready to significantly shake up the routine of World of Warcraft by announcing a new initiative called the WoW Token, which is designed to introduce an entirely new, official and secure way for two different entities to exchange gold and game time between each other. Blizzard is not yet saying when the WoW Token will be launched but it will be part of an upcoming patch for the MMO. No pricing details are offered at the moment. The company makes it clear that, while the market will be dynamic, it will not involve any bidding and the price for all the items listed in one region at one time will be the same, which is designed to make the transaction fair for those looking for game time. The tokens will not expire and it might take some time for them to be sold, depending on market conditions in each of the regions where World of Warcraft is avaialble. 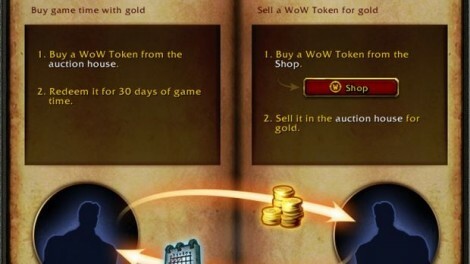 Gold farming and gold selling has been one of the major problems for World of Warcraft in the last few years and the addition of the new WoW Token is clearly designed to take that market out of the shadows and make transactions between players transparent and secure. Blizzard uses its announcement to once again highlight the negative impact that third party services can have on the game experience and the fact that often scams are associated with them. The big questions is how fast the WoW Token will be introduced to World of Warcraft and whether the company will be able to make all transactions secure in the long term. If that happens then the MMO genre might have finally found a good way of making gold sales and the problems associated with them a thing of the past.